It is a room like this that makes me know that interior design is an art. I mean, look at this space! The creativity behind it. 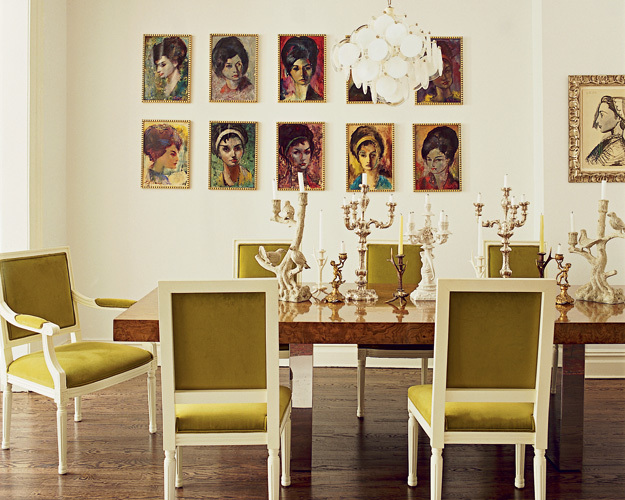 The guts to take a chance and group vintage female portraits with Louis XVI style chairs and classic silver candelabra. I would not, could not have thought of that. I would not have chosen those chairs with that (amazing) Milo Baughman table. I would not have grouped those candelabra of varying styles (the silver, the birds, the cherubs). I would not have chosen that chartreuse velvet to upholster the chairs. I love how this room just works. That is the art behind it. It is subjective, of course, like all art. I think it works. You might not. You might think this is the most hideous room you’ve ever seen! So? Do you? Do you think it works? Or do you think it’s horrible? Follow me on Facebook where this week I’ll be sharing some rooms that might be hot or hideous and looking for your opinions! https://pursuingvintage.com/wp-content/uploads/2015/06/elle-decor-dining-room.jpg 500 625 Kristen /wp-content/uploads/2013/06/colormepink-header5.jpg Kristen2015-06-02 06:30:302015-06-01 21:07:45Does it Work for You? Kristen, I think it is artfully fabulous!! Though one might not think all of the elements would work, they do!! It looks very collected and individually created. Kristen, I am a fan of Jonathan Adler and I think it would be terribly fun to sit down with you and other shelter bloggers for some pizza and wine and great conversation in that fun dining room! such a great room! I love the collection of candlesticks down the center of the table!